(page 2 of letter dated September 16, 2013 from Kitty Maidens) Yes, you read correctly, the date of the letter was September 16th , but I was to have given permission by August 28th. Last Thanksgiving eve, Wednesday afternoon of November 26, 2013 around 3:30 p.m., as I was preparing my family’s Thanksgiving feast, my doorbell rang and a worker for UPS had a delivery for me. My prize was a letter from Hunton & Williams, a legal firm representing Spectra Energies which contained the strongest language used to date. In this communication they assert I have been notified of Sabal Trial’s “legal right“to enter my property and have continued to refuse to sign their paper. 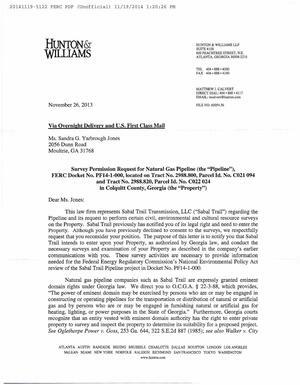 “The power of eminent domain may be exercised by persons who are or may be engaged in constructing or operating pipelines for the transportation or distribution of natural gas for hearing, lighting, or power purposes in the state of Georgia. (page 1 of letter dated November 26, 2013 from Matthew Calvert). In plain English, they were coming on my land even if I did not give permission. 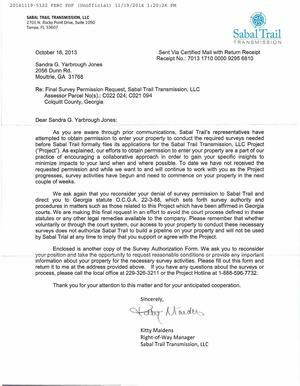 FERC commissioners, it must be noted that Sabal Trial sued two entities. One being William B. Singer and Frank S. Singer III, and the other being the estate of Harold L. Westbrook. Mr. Westbrook was a nursing home resident with Alzheimer’s disease and he died shortly before the court date. The Singers were also absent from this hearing because of a mix-up about the court date. None of the defendants were present. In his decision the judge makes note that this decision is only binding in the case of the Singers and cannot be applied in other cases. Not only does this company twist and bend our state laws, they seem to pick on those less able to defend themselves. There was another court hearing in Mitchell County involving another Alzheimer’s patient. The wife agreed to the survey after entering the court house and being placed under tremendous pressure. Another example of this is this company’s insistence of going through Daugherty County and placing the homes and lives of thousands of indigent Afro-Americans. Georgia law holds that surveying or entering private property without permission constitutes trespass and that have been three cases where this company has been brought to court and is being held responsible for their breech of law. 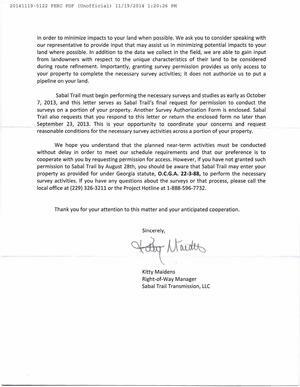 The only reason many landowners have signed for the survey is because of these terroristic threats made by this company. As the reasonable and law abiding commission you are, you must halt this company from strong-arming land and home owners into submission for their purpose. Ms. Grover knows the truth even though her lips try to deceive. What she is doing is making a mockery of all of us. 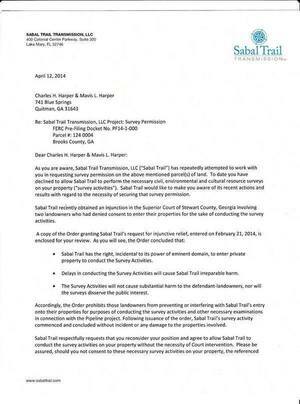 Here’s another example of Sabal Trail using that Stewart County injunction as a threat against a landowner elsewhere.